Will you destroy my home for a subdivision? How long will bald eagles continue to hunt and nest at the Upton Farmlands when the bulldozers start to tear up the land for a 350-unit housing subdivision? PLEASE keep e-mailing and calling your local politicians and ask them to support MLAs Wayne Collins and Wes MacAleer and Charlottetown candidate for the Conservative party, Tom DeBlois, in their call for a moratorium on the development of this land. 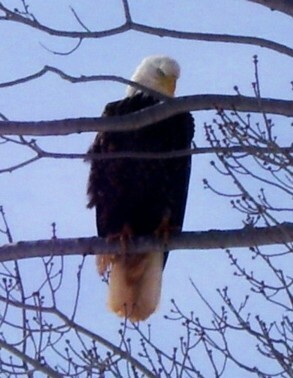 Picture Credit: Cheryl Hearn snapped this pic of a bald eagle while walking her dogs at Upton Farm a few weeks ago. It was also featured as “picture of the day” on the CBC.ca/pei website. Great shot, Cheryl! This entry was posted on April 9, 2007 at 4:41 pm and is filed under Pictures, Raising Awareness. You can follow any responses to this entry through the RSS 2.0 feed. You can leave a response, or trackback from your own site. I think what you are doing is great as a nature lover myself i do presentations on endangered animals and helping the earth as part of the HTE club (Help The Earth) the presentations are part of the animals are in-danger series. to see some of the HTE presentations e-mail me at brygettebranco@hotmail.com.